“Are you having a laugh?” In his recently completed television series Extras, Ricky Gervais’s main character Andy repeated this catchphrase to annoying effect much to the delight of audience members in his fictitious series. However, when he says the same line in the middle of Matthew Vaughn’s romantic fantasy Stardust, it not only doesn’t annoy us but actually makes us realize that yes, we are having a laugh at this comedic fantastical tale that takes its cues from both the novel upon which it’s based but also Rob Reiner’s beloved 80’s film The Princess Bride. Based on the book by Neil Gaiman, screenwriters Vaughn and Jane Goldman do a wonderful job concocting a tale that delights kids of all ages and even those of us (such as this reviewer) who never really found themselves keen on most fantasy films. Named as the Overlooked Film of the Year by the local Phoenix Film Critics Society, Stardust, recently released on DVD which makes the CGI and digital effects come to vibrant life on state of the art home theatre set-ups, chronicles the adventures of Tristan Thorn (Charlie Cox). Shortly into the film, Tristan tells the gorgeous but vain Victoria (Sienna Miller) who’s promised to another that he will return in one week’s time with a fallen star for her birthday in order to claim her heart. Once he journeys outside his countryside town of Wall into the magical land outside the wall, he realizes that the star is in the form of a luminous beauty named Yvaine (Claire Danes) and we become quickly aware that he isn’t the only person trying to retrieve the star. Michelle Pfeiffer takes the vindictive diva she portrayed in Hairspray several steps further to play the full on wicked witch Lamia, a manically laughing woman hoping to eat the heart of Yvaine in order for her and her two sisters to achieve eternal beauty and life. Rounding out the search is the remaining sons of the deceased king (Peter O’Toole) who from his deathbed entreats his sons that the rightful heir to his throne will be able to turn the star’s pendant to ruby just by the touch of his hand. 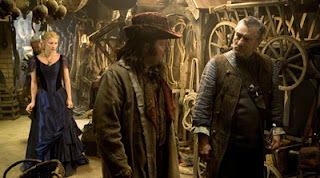 While the groups intersect from time to time to action-packed results, the film is filled with humorous misadventures and oddballs as Yvaine and Tristan encounter the closeted homosexual pirate Captain Shakespeare (a campy Robert De Niro, visibly having a blast) and the scheming Ricky Gervais as Ferdy the Fence. Narrated by Ian McKellen, this unfairly (yes) overlooked summer sleeper failed to seduce filmgoers but hopefully now given an impressive transfer to disc will attract a new generation of fans and, much like The Princess Bride, become even more popular and cult-like for years to come.